Germany is celebrating 100 years of women’s suffrage, but political power is still unevenly distributed. 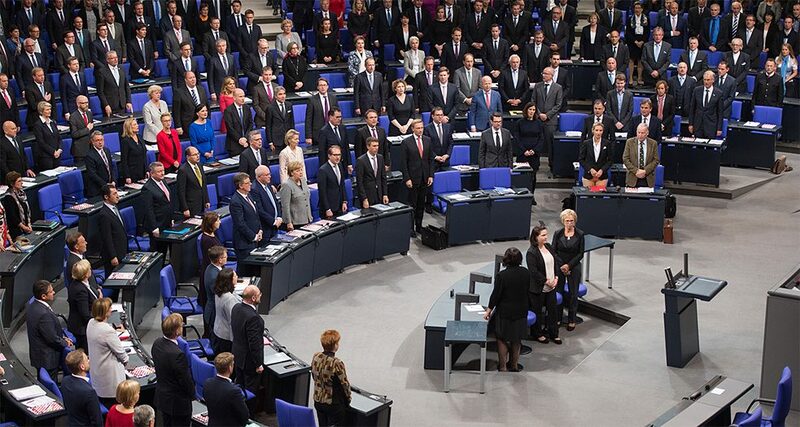 In terms of numbers, women have never been equally represented in any German Bundestag. Initiatives like the Helene Weber Kolleg are pushing for change. You can almost feel the pressure; sense the crushing, constricting force: two snow-white corsets with stiff, whalebone stays and small, unyielding hooks and eyelets are the very first thing to confront visitors to the “Damenwahl!” (Women’s Suffrage!) exhibition. The metaphor is deliberate. “Corsets were still severely confining women at the beginning of the last century, restricting their freedom of movement,” historian Dorothee Linnemann, who curated and compiled the exhibition at the Historisches Museum Frankfurt, says. 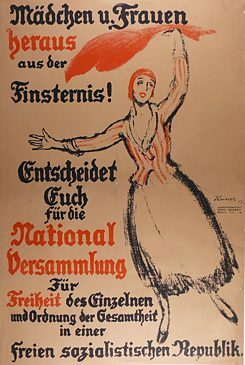 The show opened at the end of August 2018 and is the centrepiece of the “100 Jahre Frauenwahlrecht” (100 Years of Women’s Suffrage) centenary celebration. In 900 square meters the 450 items on display detail the history of the early German suffragettes, following their story right up to January 19, 1919 – the first day women were allowed to vote and be elected to public office in Germany. It continues with an overview of the post-1945 democratic reboot when equality between men and women was officially anchored in the Federal Republic of Germany’s new constitution. 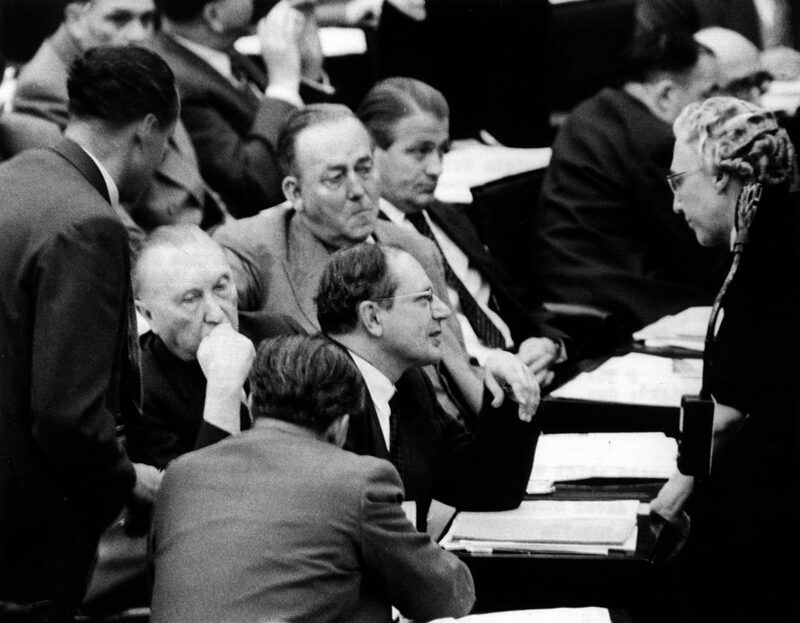 In 1956 CDU MP Helene Weber debates the national service law with German Chancellor Konrad Adenauer and other MPs in the German Bundestag. | Photo: © picture-alliance / dpa That fight for inclusion continues to this day, Lukoschat says, whether women are aiming for a leading role in business or for a top slot on a party ballot. The HWK organises mentoring programmes and seminars for young female politicians, training them in assertiveness and sharpening their PR skills so they can better handle the press, competitors and critics. “We teach them how to build alliances.” This is something the suffragettes involved in the First German Women's Movement 100 years ago modelled exceptionally well. The activist pioneers were extensively networked, and collaborated and exchanged ideas across party, religious and national lines. The Kolleg is just one of the national and international initiatives dedicated to supporting women and driving equality forward. Women’s rights groups joined in the me-too debate, and continue to advocate for fair pay and better work-family balance. The Female Future Force, for example, founded by Edition F editors Nora-Vanessa Wohlert and Susann Hoffmann, sees itself as a movement “for female empowerment”. The last Female Future Force Day networking event attracted 4,000 visitors. In Belgium, the “Brussels Binder” women’s initiative has set up an online database of female political experts and journalists. According to BB spokeswomen Scarlett Varga and Juliane Schmidt, the aim is to counteract the “mysterious” absence of women in the Brussels political landscape. Romy König is a freelance journalist who reports on healthcare, business and culture. Copyright: Text: Goethe-Institut, Romy König. This work is licensed under a Creative Commons Attribution – Share Alike 3.0 Germany license.